I am running the version I got the link off the FolgerTech Wiki. [folgertech.wikia.com] It is not the latest version out there but was the one I could get bed leveling and the LCD to work. Also has auto tune for the heaters and that works wonders. Everything a Noob like me needs for now. Download it and I will share my configuration.h file. Why all the crickets? Were did everyone go? @iamquestar - What parts did you use for the V-slot on your X? Edited 1 time(s). Last edit at 08/31/2016 01:28PM by WilberMaker. I'm having some issue with my Y axis motor and starting to think it's a hardware issue, but there may be something I missed. After following the various steps suggested to get the X motor and endstop behaving together, I've got my X axis homing properly, and the Z axis worked fine without any tweaks, but whenever I try to move my Y axis, I just get a vibrating from the motor, followed shortly thereafter by a repetitive clicking until I hit the emergency stop. After switching the connectors for the X and Y axis, I determined that there's no issue with the commands the RAMPS is sending. It send the instructions from the Y pins to the other motor perfectly, and then the commands sent from the X pins on the RAMPS to the Y motor still cause the Y motor to vibrate instead of turning. I also tried disconnecting the Y motor from the pulley and frame to see if unloading it helped, and it still just vibrates. Is there anything else I should try, or is it probably just a bad motor? Did you switch the wiring harness, if not try that. Yep, it was the harness. As soon as I switched the motor ran just fine. Thanks! I think everyone just eventually moves on to the next new cheap printer hype. Currently it seems to be the FG FT5 and the TeVo Tarantula. My FG 2020 i3 has kind of evolved, working up to its eventual 12x12" 1/4" aluminum tooling plate build plate. I got my silicone heater and ssr in this week, just need to order some more extrusion. Going to have a double z rail like the Taz eventually. Not sure what the new z height will be, I forget what size my ball screws were. Modded Sonny Lowes v2 x axis mounts to use my sfu1204 ball screws I had from another printer. Edited 1 time(s). Last edit at 09/02/2016 10:49AM by sethmo. I am trying to setup BLTouch with Marlin 1.1.0 RC7 and am having some issues. My setup has the X endstop on the right side. The issue is when I do a G28, it moves the Z-axis up 10mm then homes X and Y, then moves X & Y to the safe home position(No issues so far). 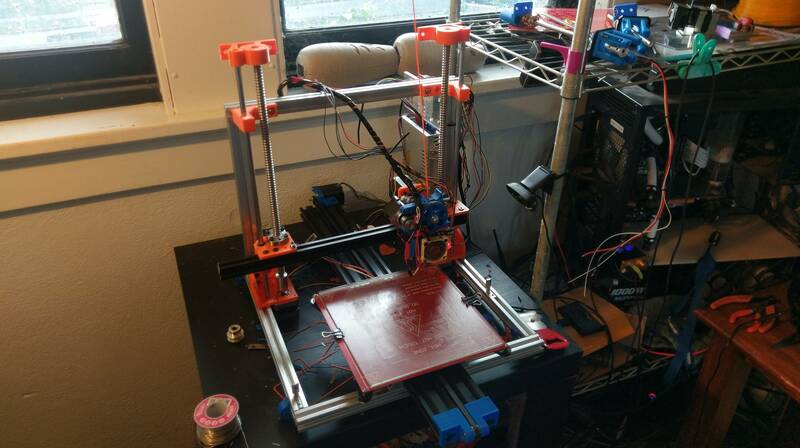 When it starts to home the Z axis it is moving up away from the bed. If I invert the Z axis, it homes down, but it also moves Z down towards the bed at the start of G28. What am I missing? I honestly don't care if it moves the Z axis away from the bed before it homes X or Y, how do I disable that? When it moves up, it's sensing that the Z "end stop' has already been made. You have to change your firmware to reverse the sensing of the BLTOUCH end stop. On an aside, I thought you had to move the endstop to the left to get autobed leveling to work? I'm running 1.1.0 RC3. Do you have it set to MAX in your Repetier and is the X endstop plugged into the MAX pins on the RAMPS? Folger Tech 2020 i3 and FT-5 as well as modified JGAurora A5 with direct drive E3D/Titan. All running the BLTOUCH. Great kits. Having fun and running the heck out of them. Running Marlin 1.1.0 RC8 on the i3 and FT5. Custom firmware on A5. Over to FaceBook. 1500 people registered but it's getting as convoluted as this string! AND it has its favorites, its experts, and its trolls. Sounds like fun. . Got a link to the Facebook group? I just finished building my 2020 i3 and I am having an issue when trying to home Z. Everything I tested up to this point has worked great. Basically when I connect using pronterface and home the Z axis the motors hum and seem to have a hard time moving. When I press the end stop while it is trying to home z, the printer moves like expected. Jogging the printer also works like expected. I am using the marlin RC7 release branch with all the edits I need for the FT, I made a video of the issue, this is with the driver tuned to 0.932. Any ideas? Edited 1 time(s). Last edit at 09/09/2016 12:11PM by ForceFedDSM. I am unable to print from my Folgertech 2020 Prusa Mendel right now because not enough plastic is coming out of my (stock Folgertech) extruder. I'm printing in ABS at 240 degrees using Repetier Host from a linux box. This machine has printed fine in the past but I left it for a while to work on other things. 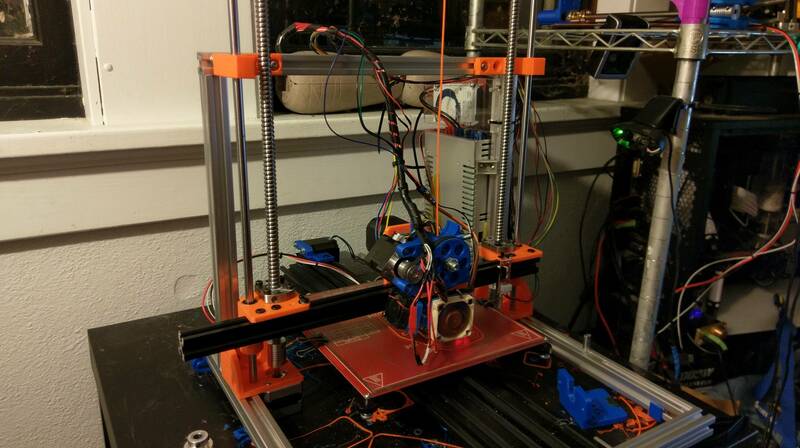 The symptom appears to be skipped steps on the extruder motor. When I disconnect the hot end from the motor, my calibration is exactly right. I can make a mark 5mm above the extruder and ask for 50 mm of filament on the manual control and it will go just to the mark, both on the fast setting and the slow setting. I can also manually push filament through the heated hot-end with little effort. But if I assemble the extruder, the calibration no longer holds, and I get anywhere from 20% to 40% shortages in the filament going in. I've tried fiddling the potentiometers on the extruder driver board but that doesn't seem to change the behavior. From my crude examinations of the motor, it appears to be pushing filament with enough force to go through the extruder. I don't see excess plastic in the driver gear teeth, and my filament doesn't appear to have a notch where the driver has ground it. I am seeing a slight swelling at the bottom of the filament when I pull it out of the heated block. I see slight leakage from the hot end, but not enough to cause the symptoms I'm having. Anyone have some ideas I could check? I'm a little reluctant to disassemble the hot end, 'specially as it appears to be working fine. Has anyone measured the force it takes to actually push plastic through it? Just built my i3 got it printing today. After I borrowed a ramps board from a friend, mine is bad. I am printing a test print now which is working. But I can't seem to get the X Axis to home. I hit home in Repetier and it doesn't move to the right where the end stop is. Any suggestions I can try? Make sure your X axis endstop is plugged in one spot over from the right on your ramps board. Manually press the X axis endstop, and type m119 into the gcode bar under manual controls. What does to command log say when you do this? Can you copy and paste your config.h file in pastbin and give a link to it. Also, can you take a screen snippet of you printer shape setting in repetier. This is a very common problem that has come up in many times in this thread, and is usually caused by improper endstop pullup defines in firmware. If I can see those settings, I should be able to give you a quick fix. Edited 1 time(s). Last edit at 09/10/2016 09:07PM by Mach. I don't know why this worked but I put the end stop on the left side and flipped the home vaule in the config to -1 and this works. for whatever reason it would not work on the right side strange but something tells me that is common. The filament should be very easy to push through the hotend. My guess would be either a partial blockage, a damaged ptfe tube, problems related to the hotend throat not being firmly seated against the nozzle, or some combination of those problems. I would say that taking apart the hotend is the best way to diagnose the problem. I have never seen this problem before, so i have no idea what it could be, but I believe 0.93 is a bit high. When it was on the right, it was X MAX not MIN. Also in Reptier, you had to tell the printer setup that it was MAX. Yes when it was in the right it was max not min in firmware and in the software. But still acted strange. Now with it on the left it seems to not complain. Weird but OK. Now on to getting octoprint to function. So what kind of part cooler is anyone using? I've still got the stock hot end on mine. New 2020 i3 Build- the short and long of it. The short It's Alive!, needs tweaking. When all else fails threaten to sell it. Assemble platform and y bearings. Must have been psychic when I bought my first "real: Dremel a few weeks ago. 1 of 3 bearing mounts fit. Dremel to the rescue. X axis assembly - z bearings fit, 1 x bearing fits - like a glove, the pair are way off, several mm's material had to be removed to make them fit lengthwise. Extruder mount bolts too short ( following instructions) with new 5kg motors, email Folger help. Screw it, off to the drill press to drill counterbores on extruder deeper, managed to not drill through when extruder climbed the bit. Put z ends on x assembly - 300mm apart? yeah right , hammer works well here, also very satisfying. Finished assembly except mounting "filament helper" - bolt too short with new 5kg motors. Monday, received email for Folger help mentioning the 2 extra longer bolts in the extruder box. Oh well, first print will be new extruder mount. fstruct error. After several days research, discovered that you must use Arduino AVR v1.6.11 or older for marlin to compile Change it in your Board manager.. Seems Arduino changed naming conventions and broke existing code, but but would not correct it. must edit pins.h to reflect actual path, supposedly with notepad or other editor. Note pad brings up unformated giberish. Download and install notepad++ - great program, worked well. I think it can be edited in Arduino also. Friday - Spare mega and ramps arrive. Existing Ramps had potential future shorts, removed them. Start trying to finish config, leveling end stops etc. Can get some movements, but no heating on bed. Swap ramps and Mega ( to test new one). Heating works, back to movements and end stops. Install Repetier Host and Server - verify control works, not correctly, but works. Z only goes down, Y seems to move 10x and only backwards. Oh, gee Update is available - new anniversary version of win10, lets update so it doesn't screw up an operating printer. Next am, download stalled at 99%. Maybe s/d and restart will finish download.Crp back to 0%. Back at 83% when I get home from work, turn off other computers to speed up download. I live on a mountain where 2 tin cans and a string provide AT&T DSL to the whole mountain, a 1gig download can take 10 hrs. Win10 updated overnight, Get up and 2:30AM to get rdy for work, Printer computer is off, beeps when turned on. Wed. , Thur. Research end stops etc on forum. Fri. Attempt Printer computer repair - repaired, loose RAM, recently replaced the power supply and Ram did get wiggled. Oh theres Fedex with Laptop. Test laptop, resolve issues. Back to the printer, go over Marlin and Animooses settings, make a change or two. Swap Y driver in case that was causing apparent 10x moves. Wupps, forgor to install jumpers under drivers when I swapped Ramps boards. Install jumpers. Sat. 9/11 - Try to compile latest Marlin using printer computer. Can't compile, Won't recognise u8lib over network to install locally. Copy its subdir from the original computer and place in Mydocuments/Arduino/Libraries . Compile works, attempt to upload -Fail Comm3 or Mega doesnt exist. Read Board with Arduino - Mega on Comm3... Windows says comm3 is mega??? Hmm, restart computer in case Repetier server has control, Still doesn't work. Repetier is not seeing Mega or ramps - x,y,z are blank. Flail, Flail. Instal ch340 serial driver, reboot - still not found. Start wondering about resale value of non working Folgertech 2020 and possibly what kind of printer to buy. Started Repartier, connected, server showed values from the printer. Manual motion worked properly in all directions. Did minor bed leveling, and z end stop. Tried to print, no extrusion, had to reverse extruder plug. Animoose mentioned it but I hadn't seen it done elswhere. I have did test prints that were rough but almost square. It homes to right front instead of rear, Ill worry about that later. How are you guys printing ninjaflex? Not going so well for me... After awhile it buckles in my extruder. Edited 1 time(s). Last edit at 09/11/2016 03:13PM by UltiFix. Is anyone else having problems getting the latest version of Repetier to work with the FT-5? Manually, it all works but when I slice and try to print, the bed heats up SLOWLY OF COURSE, and then alarms out. On the advice of a friend, I'm going to try Pronterface and Cura. I might also try an older version of Repetier. Holy hell! What an emotional roller coaster! I would have balled up under the desk and cried at some point there. I did have problems compiling with the latest Arduino, gave me errors, but still compiled. Downgrading to a previous version cleared up the errors. I'm glad at least Repetier Server works for you. Another route would be to use a RaspberryPi to control the printer (running Repetier Server or OctoPi), might have less connectivity issues in the future. Actually, tried Repetier for a larger print and it had lots of errors and re-sends. Many unrecognized commands in the dialog, like 10 day 57? Both cura and slicr show the errors . I have a pi on order. 15:17:24.002 : echo:Unknown command: "5"
15:17:24.030 : echo:Unknown command: "5"
I had lots of the line number errors along with unknown command errors.I was printing a filament holder side/end. Sl3cr was looking ok but I think the filament bound up ad caused missed steps shifting layers bay about .25". Cura didn't even put holes in the print. Don't want to deal with it during the weekl, I only ge 5.5 hrs sleep as it is. You said it works manually - was that using the LCD controller or Repetier/Pronterface? Does your computer show the MEGA as a device?